LeAnne Gompf | Morrow County Sentinel These members of the Cardington High School Class of 1945 attended the Cardington-Lincoln High School Alumni party where they celebrated the 70th anniversary of their graduation. Back row l-r: Clydelle Thomas, Martha Maxwell Armstrong and Jim Shoults. Seated: Evelyn Davis Shoults, Elizabeth Davis, Mary Ellen Miller Dune and Beulah Beatty Smith. 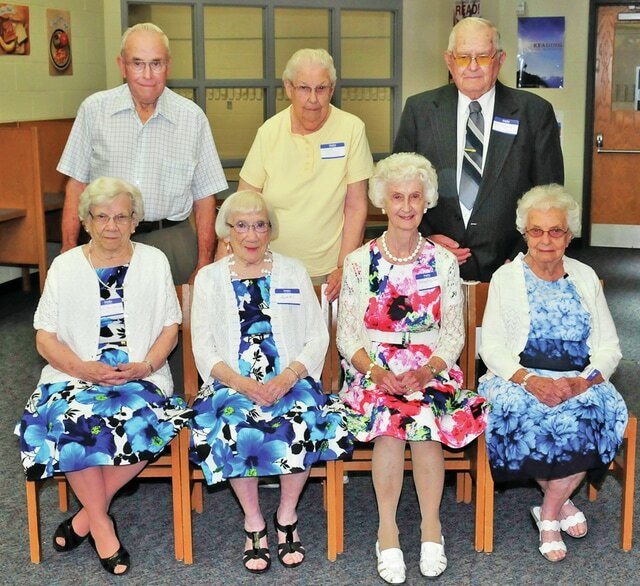 Seven members of the Cardington High School Class of 1945 attended the Cardington-Lincoln High School Alumni party where they celebrated the 70th anniversary of their graduation. The class graduated with 31 members. There are 17 deceased. Sending their good wishes but unable to attend were Jack Hildebrand, Louisville, KY; Jim Harvey, Parkersburg, West Virginia; Doris Mathias Rinehart, Galion and Howard Shaw, Port Orange, Florida. All of those pictured are from Cardington with the exception of Jim and Evelyn Shoults and Martha Armstrong, of Mount Gilead and Elizabeth Davis and Mary Ellen Dune from Marion Evelyn and Elizabeth are twins. Each class member was given a special gift created by Joanne Mathews.